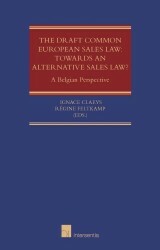 The Draft Common European Sales Law: Towards an Alternative Sales Law? oktober 2013 | 335 blz. With the 186 articles of the Common European Sales Law the European Commission proposes an optional legal framework that covers the entire lifecycle of sales contracts and contracts for the supply of digital content, as well as related services. This book is the first to delve deeply into the content of the CESL and to analyse it.